Box Text: ALL SHIPS, REPORT IN! It's been several years since disaster was averted on Dinosaur Planet, and Andross's armies have been almost eradicated... but now a new threat has risen from the darkness of space. 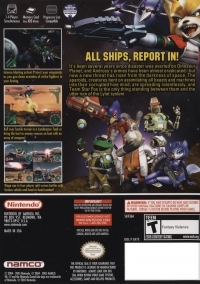 The aparoids, creatures bent on assimilating all beasts and machines into their corrupted hive mind, are spreading relentlessly, and Team Star Fox is the only thing standing between them and the utter ruin of the Lylat system. • Intense blistering action! Protect your wingmates as you gun down armadas of strike fighters in your Arwing. • Roll over hostile terrain in a Landmaster Tank or bring the hurt to enemy swarms on foot with an array of weapons! • Wage war in four-player split-screen battles with furious vehicle and head-to-head combat! 01-31-2019 silverbow Box Text ALL SHIPS, REPORT IN! It's been several years since disaster was averted on Dinosaur Planet, and Andross's armies have been almost eradicated... but now a new threat has risen from the darkness of space. 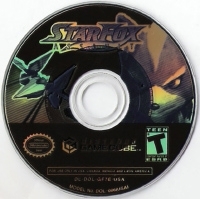 The aparoids, creatures bent on assimilating all beasts and machines into their corrupted hive mind, are spreading relentlessly, and Team Star Fox is the only thing standing between them and the utter ruin of the Lylat system. • Intense blistering action! Protect your wingmates as you gun down armadas of strike fighters in your Arwing. • Roll over hostile terrain in a Landmaster Tank or bring the hurt to enemy swarms on foot with an array of weapons! • Wage war in four-player split-screen battles with furious vehicle and head-to-head combat! 10-24-2012 lordservbot Box Text It's been several years since disaster was averted on Dinosaur Planet, and Andross's armies have been almost eradicated...but now a new threat has risen from the darkness of space. The aparoids, creatures bent on assimilating all beasts and machines, into their corrupted hive mind, are spreading relentlessly, and Team Star Fox is the only thing standing between them and the utter ruin of the Lylat system. 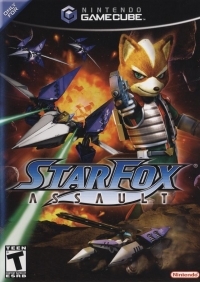 This is a list of VGCollect users who have Star Fox: Assault in their Collection. This is a list of VGCollect users who have Star Fox: Assault in their Sell List. This is a list of VGCollect users who have Star Fox: Assault in their Wish List.